YouGov | Eight in 10 Indian women have faced "mansplaining"
on October 27, 2017, 7:48 p.m. While only 28% of women have come across the term before, the vast majority have encountered "mansplaining"
“Mansplaining”, as defined by Merriam-Webster, is “when a man talks condescendingly to someone (especially a woman) about something he has incomplete knowledge of, with the mistaken assumption that he knows more about it than the person he's talking to does”. 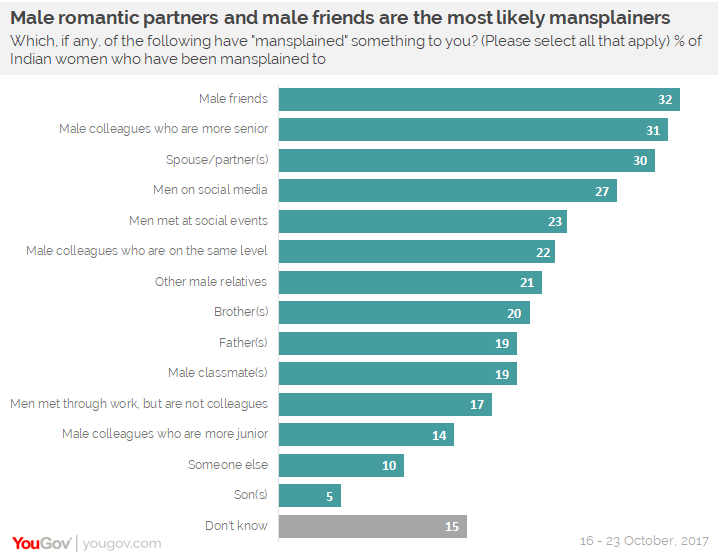 Now, new YouGov Omnibus research shows that 80% of women in India have experienced "mansplaining", with one in four (24%) saying that they have experienced it “often”. 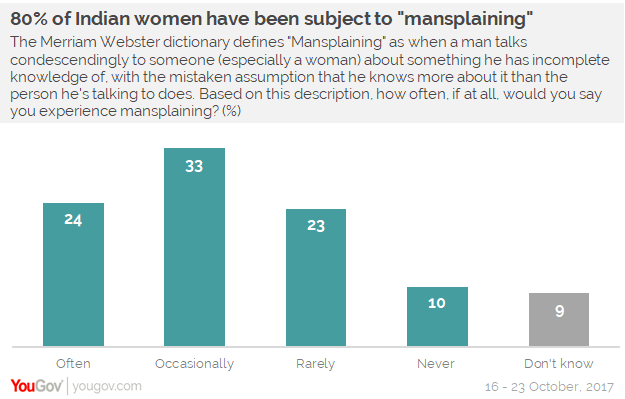 The largest proportion of women (33%) say that they “occasionally” face mansplaining, while only one in ten say they have “never” been subjected to it. The results also reveal that recognition for the term itself lags far behind the experience of it. Only 28% of women said they know what “mansplaining” is, while a further 17% have heard of or read the expression but don’t know what it means. Male friends are the most likely mansplaining culprits, with 32% of women who have experienced mansplaining saying that they have endured it from their male friends. Other common offenders include male work colleagues who are more senior (31%) or on the same level (22%) as the women in question, partners/spouses (30%) and men on social media (27%). 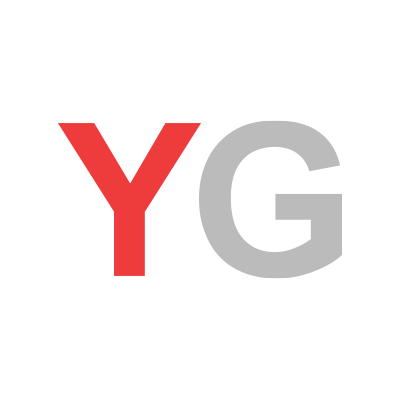 Data collected online by YouGov Omnibus between 16 and 23 October 2017 among 406 female respondents in India. Results are representative of the adult online population in India.